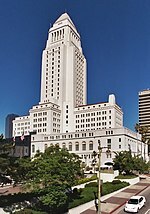 The 1997 election for Mayor of Los Angeles took place on April 8, 1997. Incumbent Richard J. Riordan won the election against California State Senator and prominent 1960s SDS activist Tom Hayden. This was the last mayoral election for Los Angeles in which a Republican candidate won. ^ "City of Los Angeles Primary Nomination Final - Official Election Results". Office of the City Clerk, City of Los Angeles. ^ "Los Angeles Mayor". Our Campaigns. ^ Officially all candidates are non-partisan. This page was last edited on 28 March 2019, at 02:56 (UTC).